The Southern Poverty Law Center (SPLC) is a U.S. based 501(c)(3) non-profit organization that claims to “battle racial and social injustice” in America, yet SPLC’s words and actions reveal it is a terrorist support organization which actively works to accelerate the Islamic and hard-left Counter-States in their goal of overthrowing the United States government. As Understanding the Threat (UTT) consistently reports, the war in which we are engaged consists of two major Movements acting as “Counter-States” to the United States of America; The Global Islamic Movement and the hard-left Marxist/Communist/Socialist Movement. This is a war primarily fought in the Information Battlespace where Propaganda, Influence Operations and Political Warfare are the key lines of operation. Political Warfare is defined as the synchronization of non-violent and violent actions in support of the strategy. The “victim/grievance creation” tactic used by the Islamic and hard-left Movements is Political Warfare at its finest. Both the Islamic and hard-left Movements take a series of actions within their strategies to create the illusion of unjust wrongs, and then work within communities to redress these “wrongs.” In all cases, the actions of redressing of “wrongs” advance the ultimate goal of destroying the underpinnings of our nation which will necessarily lead to the overthrow of the United States system of government. One example in the Islamic Movement is when suit-wearing jihadis’ claims “terrorist attacks” create “backlash” against the Islamic community which necessitates law enforcement, churches, synagogues, political leaders, and others to take actions to “protect” muslims. The violent jihadis thus work with the non-violent jihadis to create more room for the Islamic Movement to operate and gain ground. Similarly, the hard-left Marxist/Communist/Socialist Movement create a straw-man by grossly exaggerating the racist problem in America and likening anyone who speaks truth about SPLC-protected groups as “racist” in order to destroy their ability to operate in the public arena. It was reported this week by the Washington Freebeacon that the Southern Poverty Law Center’s business income tax return from 2015 and other records from 2014 show the SPLC has “financial interests” in the Cayman Islands, British Virgin Islands, and Bermuda, and has moved millions of dollars overseas into unregistered accounts. These are strange transactions for a U.S.-based non-profit organization, unless it is actually a propaganda and political warfare arm of a hostile Counter-State actor. The article also noted that SPLC leaders Richard Cohen and Morris Dees are paid nearly $330,000 per year for leading the SPLC, a non-profit organization. None of this activity is shocking for those who know the Southern Poverty Law Center is an advocate for terrorist organizations like Hamas. The SPLC regularly defends and advocates for the terrorist group Hamas doing business as the Council on American Islamic Relations (CAIR). Examples of SPLC defending/advocating for Hamas (dba CAIR) can be found here, here and here. At no point has the Southern Poverty Law Center ever published the evidence regarding CAIR revealing it was created by the U.S. Muslim Brotherhood’s Palestine Committee (Hamas) to be a node for Hamas in America. In the war in which the U.S. is engaged domestically against the Islamic and hard-left Counter-States, the SPLC is engaged supporting both enemy entities in the propaganda and political warfare spheres, which makes them a hostile entity against the United States in this war. The SPLC cannot feign ignorance. SPLC’s President Richard Cohen sat next to UTT’s Vice President Chris Gaubatz in 2016 during Mr. Gaubatz’s testimony before Senator Ted Cruz’s Committee when Mr. Gaubatz detailed the threat of Islam, the Muslim Brotherhood, and Hamas (dba CAIR). Chris Gaubatz posed as a converted muslim and went undercover at Hamas headquarters in Washington, D.C. (Council on American Islamic Relations), removing over 12,000 documents from their offices and obtaining 300 hours of covert audio and video recordings. SPLC’s Richard Cohen (left) listening to UTT’s Chris Gaubatz discuss the activities of Hamas doing business as the Council on American Islamic Relations (CAIR). 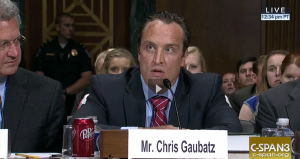 See Chris Gaubatz’s 7 minutes of testimony here. 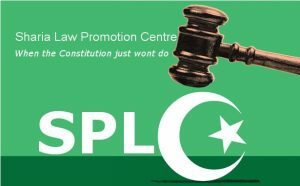 The SPLC lies, deceives, and obfuscates the truth about the jihadi threat to America because it is participating in its advancement and the advancement of the Islamic and hard-left Counter-States. The SPLC should be investigated for its irregular financial activities, its support for terrorists, and for participating in actions taken by hostile entities to overthrow the United States government. Excellent article, John. However, the following information about the SPLC endowment should also be mentioned. Via this hard-to-find link on the SPLC website, https://www.splcenter.org/about/financial-information we lean that, “At the end of the fiscal year, our endowment – a special, board-designated fund established to support our future work – stood at $319.3 million.” This absurdly bloated endowment confirms the “big business” aspect of the SPLC. SPLC’s Richard Cohen is a George Soros lackey. Any time an off-shore banking arrangement emerges whereby ultimate control of “charitable donations” comprising high-volume digital money transfers devolves to “various sources”, I.e., is decentralized – particularly in view of the Southern Poverty Law Center’s alleged unflagging support of the Global Islamic Movement’s sharia-adherent terrorist organization known as Hamas, aka in the U.S. as “CAIR”, it should be red flagged and scrutinized by the Department of Justice. Albeit, since the plethora of “wink & nod” judicial nominees emerging are to elitist immunity what “money launderers” have been for years to the proceeds of crime, I.e., corrupt agents of criminal cover-ups, no one should count on that ever actually happening without supporting UTT thus joining its’ fight. Thank you UTT for bringing to light the role of the SPLC in its support of the MB and all the work your organization does to keep Americans educated on the true threat of the global Islamic movement in America and throughout the world.